The Second Amendment is meant to prevent government tyranny by ensuring that the people are as armed as possible, and was written with this intent. An armed population will serve as a deterrent and the ultimate check to government power. The Second Amendment ensures the safety of the Constitution and all of our liberties. Without the Second, all the other amendments would fall as well. The primary purpose of the amendment is not self-defense or hunting and recreation. Rather, it is for the collective defense of Americans from their government. There is little to no evidence that the founding fathers intended the Second Amendment as a “doomsday proposition.” In fact, the language of the constitution directly refutes such an interpretation. Let’s start by looking at the text of the Second Amendment itself. I’ll skip over the “well regulated” part for now as any argument for constitutional insurrection necessarily overlooks this phrase (kind of hard to stage an insurrection when you are being “well regulated” by the government you are trying to overthrow). I would like to examine the “being necessary for the security of a free State” portion. Notice that the text does not read “being necessary to overthrow the State” or “being necessary in case some dude feels the State has become tyrannical.” The purpose of a Militia and the reason “the right of the people to keep and bear Arms, shall not be infringed” is to protect the state. Period. As Dennis A. Henigan notes in Arms, Anarchy and the Second Amendment, “How, then, can the Amendment that purports to express distrust of state governmental power, and to create a right to be armed against abuses of that power, also elevate the defense of state government to a constitutionally protected value?” The answer of course is that the insurrectionist interpretation of the Second Amendment is logically impossible. There is no language in the Constitution advocating armed insurrection. In fact, the Constitution lays out the polar opposite case. The Militia is supposed to suppress insurrections against the state, not start them. Also obvious is that the term “Militia” does not refer to an unorganized mob but rather a trained force ready to repulse any military threat to the State. During this time period the US did not have a standing military, meaning the militia was the first, last, and only line of defense against armed threats. Just as the military and National Guard (the modern version of the Militia) are the guarantors of State security today, so too was the Militia during the early days of the Republic. Shay’s Rebellion (1786) – Government had become “tyrannical” because courts permitted creditors to collect debts by seizing the property of debtors. The crackdown on debts and an increase in taxes created a large amount of discontent among already struggling farmers. These farmers, armed with muskets, threatened the state government, prevented the seizure of property, and blocked the collection of taxes. Property after all is a fundamental freedom, and seizing that property was a sure sign of tyranny. It is worth noting that in neither of these cases did the founding fathers find the arguments for insurrection persuasive. Madison called the Shay’s Rebellion “treason“, and it was immediately condemned by George Washington and the other Founding Fathers. The Founding Fathers (with the exception of Thomas Jefferson) saw Shay’s Rebellion as a prelude to anarchy and swiftly set out to strengthen and eventually replace the Articles of Confederation with the Constitution, in large part to combat future insurrections. In response to the Whiskey Rebellion, George Washington put these federal powers to use (including the Militia Acts of 1792) and suppressed the rebellion with a militia force of nearly 13,000 men. 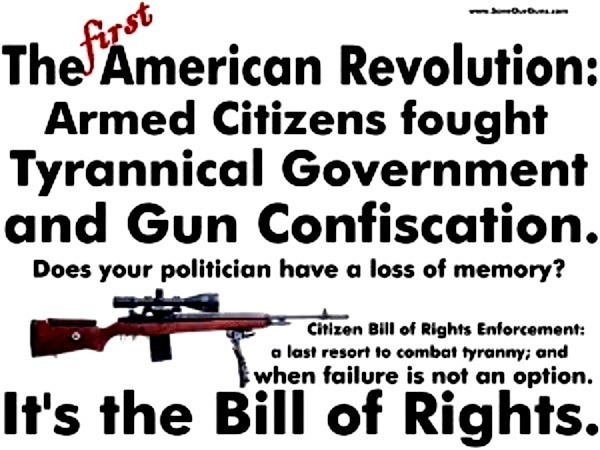 This early history of our country also reveals what the founding fathers intended as a “Militia.” In 1792 Congress passed the Militia Acts, which conscripted every able bodied male (with a few exceptions) between the ages of 18 and 45, and mandated these conscripts supply most of their own equipment, including a rifle (yes, the Founding Fathers supported and enacted an individual mandate). They were required to report to musters, where their weapons were registered on public rolls (yes, the Founding Fathers supported and enacted a national gun registry). While the Founding Fathers saw these measures as necessary for the security of a free nation, insurrectionists today would probably decry these policies as unconstitutional and a step down the road to serfdom, just as they irrationally denounce all attempts at common sense gun reform as an assault on fundamental liberties. Even if we accept the inherently absurd proposition that the intention of the Second Amendment is to promote armed insurrection as a “doomsday provision” or the ultimate check on government power (along with ignoring the early history of the US), the weapons that are currently legal would do little to stop a government bent on usurping our constitutional rights. Even fully automatic weapons would do little to stop a determined military response. Unregulated, undisciplined mobs, that insurrectionists feel the Constitution refers to as Militias and are the vanguard against tyranny have a history in the United States. One only has to look at the examples of the Ku Klux Klan, Neo-Nazi elements, the Black Panthers, and other armed groups to see that these supposed militias only create more tyranny and fear, not liberty. Armed intimidation, which is what insurrectionists contend is necessary to stop tyranny, is a form of tyranny in and of itself. Part 2 will debunk the myth that the Second Amendment provides an unlimited right to firearm ownership. Part 3 will debunk the myth that Militias (even in the Constitutional sense) are effective at preventing tyranny. Part 4 will tackle the broader philosophical debate of the freedom to bear arms.